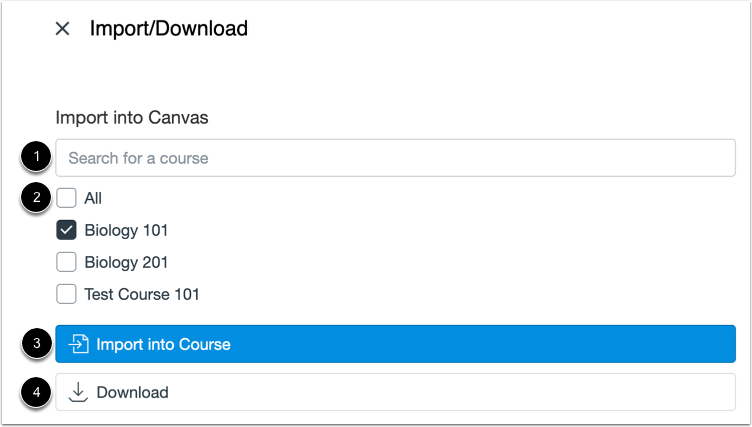 You can import courses, modules, assignments, quizzes, discussions, pages, or files from Commons into your Canvas course. Imported resources will retain their original published or unpublished status. Standard Canvas file storage limits apply. Student data will remain private when sharing and importing resources. Options/settings are retained in resource imports. All due dates will be removed. Commons currently does not support sharing/importing question banks associated with a quiz. In Global Navigation, click the Commons link. Locate a resource by using the search field . You can sort resources by Most Relevant, Latest, Most Favorited, or Most Downloaded . You can also filter search results by approved content, type of content, grade/level, and sharing settings . Learn more about searching in Commons. To view resource details, click the resource title. Note: Resources can be opened in a new tab by pressing Command (Mac) or Control (PC) while clicking the resource name in the Search page, or, by right clicking the name of the resource. To import or download the resource, click the Import/Download button. Search for the course(s) into which you would like to import the resource , or select the course(s) from the list . Then, click the Import into Course button . 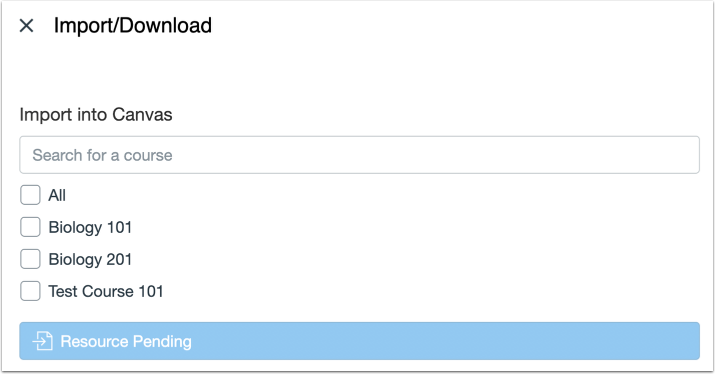 To download the file to your computer, click the Download button . 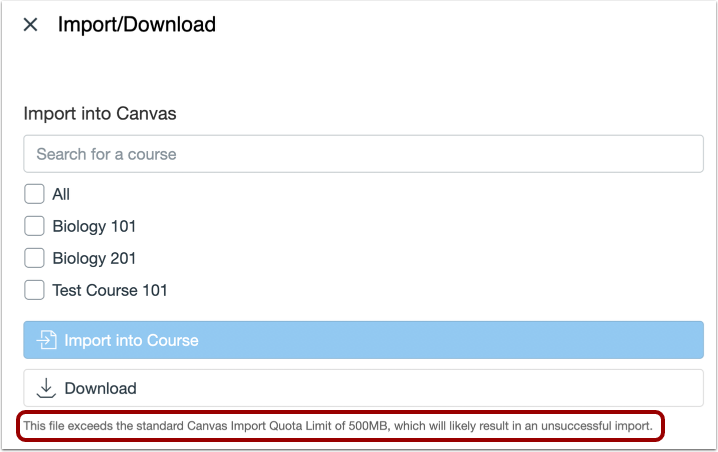 Canvas users enrolled in a course as an Instructor, TA, Designer, or a custom role based on one of the previously listed roles will see the Import into Course list, provided that the course they are enrolled in is current. If a course is set to override term dates and the Users can only participate in the course between these dates checkbox is selected, the course will appear in the course list if the course end date is not in the past. If a course uses term dates, the course will appear in the course list if the term start date is not in the future and the end date is not in the past. If you are importing a file that exceeds 500MB, Commons will generate a warning message notifying you that the import may not be successful. If you try to import a resource that is still pending, the Import into Course button will be inactive, and Commons will display a message notifying you the resource is still processing. View the import status notification at the top of your screen. Please note that it may take a while to see changes in your course. 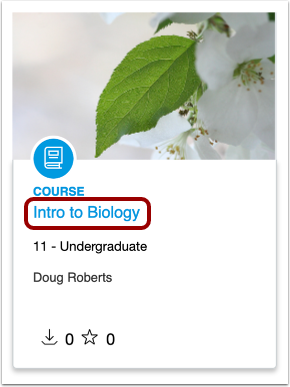 To view imported resources other than a course, navigate to the feature area (e.g., Modules, Assignments, Quizzes, Discussions, Pages, or Files) in Course Navigation. If the resource is still being imported, you will see a status notification when you open your course. Click the Import Status link. To correct any issue(s) that may have occurred with the import, you can use either the issues link next to the import or you can use the Course Navigation menu to move around the course and correct the errors. Previous Topic:How do I preview resources in Commons? Next Topic:How can I leave a review for a resource in Commons? Table of Contents > All Users > How do I import and view a Commons resource in Canvas? Re: course copy for a colleague ? Re: I have uploaded a module to Commons and need to edit it to make improvements. How can I add the amendments so other users can update their content? Re: How do I change the default assignment submissions guidelines to always accept online submissions?